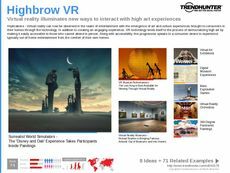 Find Better Ideas, Faster ® with a custom virtual reality entertainment trend report, our PRO Dashboard and 80+ categories of premium trend reports. 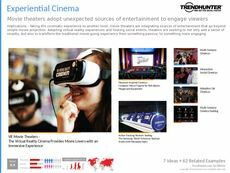 The Virtual Reality Trend Report studies the new developments in technology that are taking over cinema, social media, gaming systems and television. 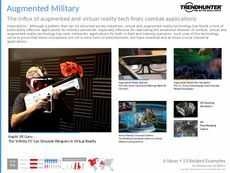 Gadgets like 360-degree cameras, rotating screens and virtual reality headsets are explored as well as the brands that make them like Oculus Rift and Samsung. 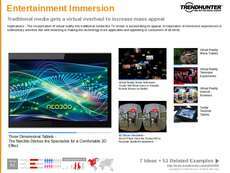 We also examine virtual reality's power in marketing products or experiences excitingly. 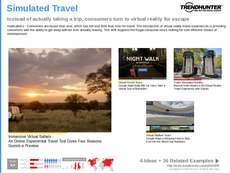 Finally, simulations of travel, flight and adventure sports are highlighted, as well as the potential of VR to connect people across the globe over social media. This report is curated for professionals in the entertainment and gaming industry who will better understand the future of interactive cinema and video. Designers of electronics and technology for virtual reality systems like 3D glasses, rotating screens and 360-degree cameras will also benefit from this data. 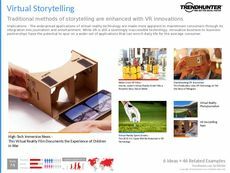 Looking at the future of entertainment and technology, the Virtual Reality Entertainment Trend Report is a study into emerging virtual gaming, television, cinema and social media innovations.